Moving Leads | Are Pending Leads Quality Leads? Get the Facts. It is a common misconception that “pending” status means a homeowner is a better prospect. If you choose to focus your marketing campaigns on pending leads you are missing out on opportunities. 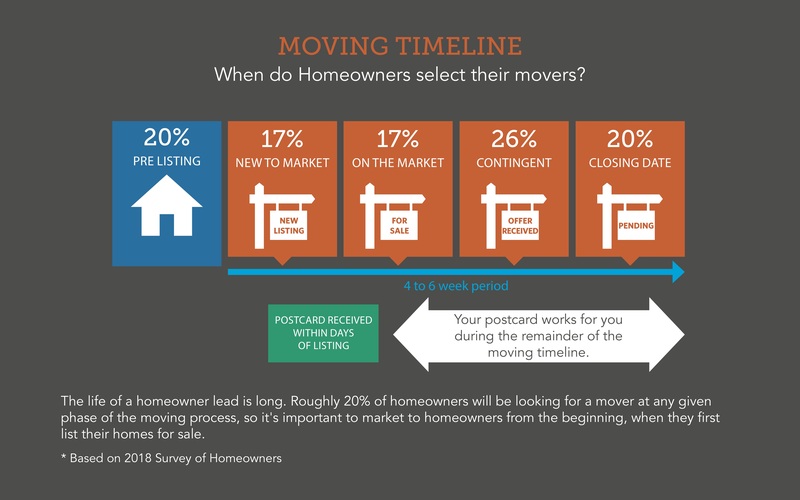 Below we share what we have learned about the homeowner’s timeline when choosing to hire a mover, pending status inaccuracies from otherwise trusted sources, and how your marketing dollars can be better spent to capture more opportunities. Once the home reaches the pending stage, chances are, you’re already too late. On average, we’ve found that 80 percent of homeowners have already decided which mover to hire once they reach the pending stage. That’s why we focus on delivering the freshest leads as quickly as possible. Timing is crucial. The later in the timeline that you send a postcard, the more opportunities you miss. Plus, when the market is hot and properties are moving quickly, listing time is short. Tip - It’s important to contact homeowners as soon as they list their home so that they can refer to your postcard at any time during the moving timeline. Homeowners hold onto postcards and will call when they are ready. Since 2003, our primary business is data publishing and we specialize in pre-mover data. We monitor public sources that advertise properties for sale. We’ve found that the accuracy of the data is most precise at the time of a new listing. The later stages of the property are often inaccurate. On popular sites, like Zillow and Redfin, the home status is not updated regularly and is often old or just plain wrong. Properties can be sold for weeks or months and the listing remains in pending status on the website. Our new listing leads are double verified to be homeowner owned and occupied. When pending listings are re-verified, we find that a significant percentage of homeowners have already moved. Beware that if you’re purchasing an unverified pending leads list, that many of those leads are defunct. Tip: There’s only one place to get the true pending status and that is directly from the MLS. It’s to your advantage to brush up on your local MLS rules. Each MLS has its own set of rules and most restrict its use to members only. If you are offered MLS information directly from a Real Estate agent, be aware that you and the Agent may be breaking the rules of the MLS. Here is a sample of MLS restrictions. Is it better to mail to more new listings than to do a second mailing? It depends. If you have the budget, you can always expand your reach on new listing leads. As mentioned before, 80 percent of these leads have not made a decision yet on their mover. Since direct mail averages a 1 to 3 percent response rate, more mailings equal more calls. In our experience movers that have re-mailed to older leads have not seen a significant increase in the response rate. However, it is a good way to remind homeowners about your business and catch the homeowners that are still considering what mover to hire. Our list rental allows a follow up mailing within 30 days of the original mailing. So sending a second postcard to your existing leads is one-way catch those homeowners that have moved into pending status and make a second impression. Tip: You need to consider the time of year if you are planning on sending out a second mailing. During the summer when the real estate market is moving quickly, a mailing two weeks after the listing hit the market may not be quick enough. It’s better to spend your marketing dollars on more new listing leads. In the slower months a mailing 2-4 weeks after listing will be perfect timing for a second impression since the homes tend to stay on the market longer.